Athora is a Bermuda-domiciled insurance and reinsurance group established to be the leading specialist solutions provider for the European insurance and reinsurance market. We have operating insurance subsidiaries in Belgium, Germany and Ireland and reinsurance subsidiaries in Bermuda, the world’s second largest reinsurance market, and Ireland. As of the start of 2019, we have total consolidated assets of approximately €15 billion and some 800 employees in Belgium, Germany, Ireland, the United Kingdom and Bermuda. Our business is defined by efficient and effective operations, highly skilled team members who provide expert services, and sophisticated asset management capabilities. These hallmarks are essential to serving our markets and creating value for our constituencies (customers, brokers, employees, regulators, and shareholders) in today’s challenging environment for insurance providers in Europe. Our investor base is comprised of highly sophisticated institutional investors who have taken a long-term approach to their investment in Athora and share our vision for building a market leading insurance and reinsurance business. Athora’s shareholders represent blue-chip institutional investors from across the globe and comprise pension funds, sovereign wealth funds, family offices, and financial services companies. We have a close partnership with two strategic investors in particular, both having representation on our Board. Apollo Global Management, through its subsidiaries, provides asset management and advisory services and Athene Holding Ltd., our former parent company, is a preferred reinsurer partner. 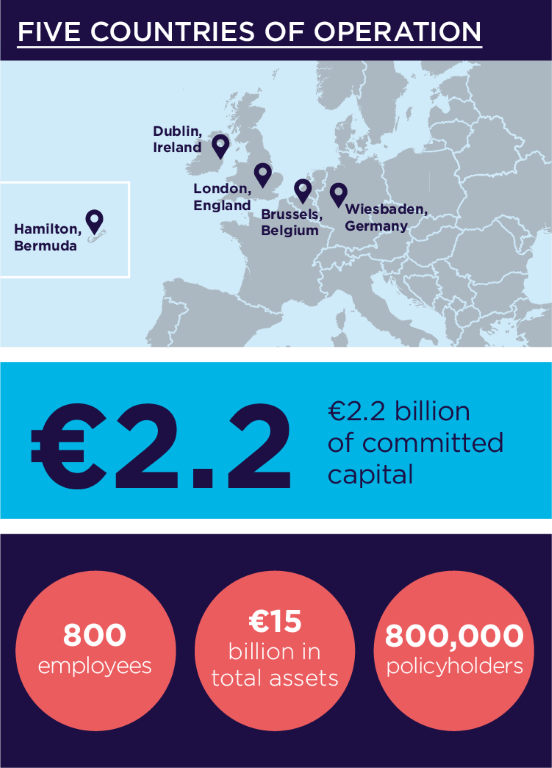 Athora has €2.2 billion of unconditionally committed capital which represents the largest ever dedicated equity capital commitment from global institutional investors to the consolidation of European insurers and reinsurance. We utilise our capital to support the growth of our existing franchises and businesses and build a stand-alone independent and integrated insurance business. This growth is achieved through both acquisitions as well as the organic growth of our franchises. We have completed three acquisitions in four years: Delta Lloyd Deutschland AG, Aegon Ireland plc and Generali Belgium NV/SA. Athora was founded in 2014 for the specific purpose of focusing on the European insurance market. We manage over €15 billion of assets for approximately 800,000 policyholders in Europe and have 800 employees in Belgium, Germany, Ireland, the United Kingdom and Bermuda. Our mission is to create a long-term insurance and reinsurance business and a well-recognised European franchise across both retail and insurance clients, take on specific business segments, companies and portfolios which are non-core to their existing owners and make them the full focus of our business activity, provide long-term certainty and security to our policyholders, and generate stable returns for our shareholders. We spun off from our former parent, Athene Holding Ltd, in January 2018. Following Athene’s example, Athora is on its way to become a leading insurance company in Europe. We see a similarly compelling market opportunity for Athora in Europe today, as was the case for Athene in the U.S. nearly 10 years ago. Through our continued strategic partnership with Athene, Athora has access to insight, expertise and a long-term reinsurance partnership which we believe provides Athora and its constituencies with numerous benefits. We view four main constituencies for our business: customers (including end consumers, distribution partners, brokers and insurers), employees, regulators and shareholders. All aspects of our business (especially customer service, risk management, compliance, financial management, and information technology) work together to support these constituencies, allowing us to achieve a balance that results in a strong, sustainable franchise. We see the following as the key success factors which allow us to serve our markets and create value for these constituents: flexibility of our operating model, equally focused on acquisitions and reinsurance; efficient and effective operations, run by highly skilled and motivated team members; access to differentiating investment strategies; and sound and highly focused capital and balance-sheet management. To support Athora and its business plan, we have put in place an expert management team and experienced Board of Directors. Our group and subsidiary management teams have hundreds of combined years of experience in the insurance and broader global financial services industries and our Board brings a set of diverse management, operations, governance and oversight experiences across industries. Through our other strategic partnership with subsidiaries of Apollo Global Management LLC (including Apollo Asset Management Europe LLP), we possess best-in-class asset management capabilities. These capabilities provide advantages and benefits not typically seen with captive asset managers, such as scale, product and geographic access, allowing us to manage assets with an appropriate risk-return balance to meet all policyholder obligations. Through our strategic partnership with Athene, our preferred reinsurance partner, we have access to an experienced management team which has grown Athene Holding Ltd. from a start-up in 2009 to approximately $100 billion in total assets (US GAAP total assets as at 31 December 2017). We will draw on that experience in building an equally successful European solutions business. We have four principal operating subsidiaries. Athora Lebensversicherung AG is based in Wiesbaden, Germany which was acquired by Athora in 2014. The company has been in run-off since 2010 and since that time has developed the experience and efficiencies critical to succeed as a run-off specialist. It serves guarantee, endowment, unit linked, and disability life customers. In April 2018, we completed our acquisition of Aegon Ireland plc, an Ireland-based reinsurer and insurer. The company offers a full range of highly customised life reinsurance solutions while expertly administering insurance policies for customers in the United Kingdom and Germany. We also perform many group services from our office in Dublin. Our principal reinsurance subsidiary is Athora Life Re based in Bermuda. Together with Athora Ireland, Athora Life Re offers internal and third-party reinsurance solutions to Athora’s operating subsidiaries and other insurers within Europe. Athora Life Re and Athora Ireland have both been given Insurer Strength Ratings of BBB+ with a stable outlook by Fitch. In January 2019, we completed the acquisition of Generali Belgium SA, which offers a broad range of insurance solutions to retail and corporate clients in Belgium. One of our core competencies is the successful integration of acquired companies and employees into our organisation. In the process, we also continually develop the infrastructure and capabilities to support our future growth. Our customers benefit from these capabilities through economies of scale, sophisticated technology and continual innovation.